While soft, silky aubergine is a thing of beauty, under-cooked aubergine is one of the worst thing you can put in your mouth. The first time I made this I was a little nervous about getting the aubergine cooked within 10 minutes, but to my surprise it was a cinch. Covering the frying pan to keep the heat in and cutting the aubergine into relatively small chunks are the secrets to speedy cooking. And don’t worry about not salting the aubergine first: modern varieties don’t have the bitterness that salting used to get rid of. 1. Heat a generous amount of olive oil in a large frying pan. 2. Cook aubergine chunks over a medium-high heat, covered. Stir every few minutes until aubergine is super soft and a little golden. 3. Add chickpeas and ground coriander and stir through until chickpeas are warm. 4. Remove from the heat and add 1 tablespoon lemon juice. 5. Scatter over coriander leaves and serve. short on time? – use grilled aubergine slices from the deli and just cook until everything is warm. different legumes – replace chickpeas with about 250g canned or home-cooked beans, lentils or quinoa. more veg – add zucchini, peppers, tomato. herby – mint, parsley or basil are good instead of the coriander. cheesy – it’s lovely with goat’s cheese or feta crumbled over. carnivore – serve as a side to roast or pan fried chicken or brown some crumbled sausages and add to the pan. carb lovers / more substantial – serve wrapped in warmed tortillas or flat bread. paleo (grain, legume & dairy-free) / low carb – replace chickpeas with chicken thighs fillets – cook until chicken is no longer pink in the middle. aubergine (eggplant) – will keep in the fridge wrapped in a plastic bag for a few weeks. Can be frozen if needed. Or cooked eggplant eggplant should last a month or so. can chickpeas / ground coriander – keep in the pantry. coriander (cilantro) – freeze it in a plastic bag. Yes! Just cook as per the recipe but keep the coriander separately. Will keep in the fridge for 2 weeks or can be frozen. To serve, warm in a pan with a little oil. I used this as my inspiration for tonight’s supper! I sautéed the eggplant with garlic and then added some halved cherry tomatoes, fresh basil and thyme, a bit of salt and a splash of white wine, then the chickpeas. I served it over pasta with parmesan for my husband and on it’s own with a dash of curry powder for myself. It was excellent! Tried this tonight-my first Stonesoup meal plans recipe endeavour! It was delicious! I used Japanese eggplant and added red peppers and spinach to cut the heaviness of the chickpeas. If I make it again and have time I’ll sauté some onion first and maybe throw some chopped walnuts in at the end. Or add some feta, as suggested. I found the lemon juice really made the flavours come together. Thanks, Jules! So glad you liked it Lorriane! Thanks for reporting back Jane! 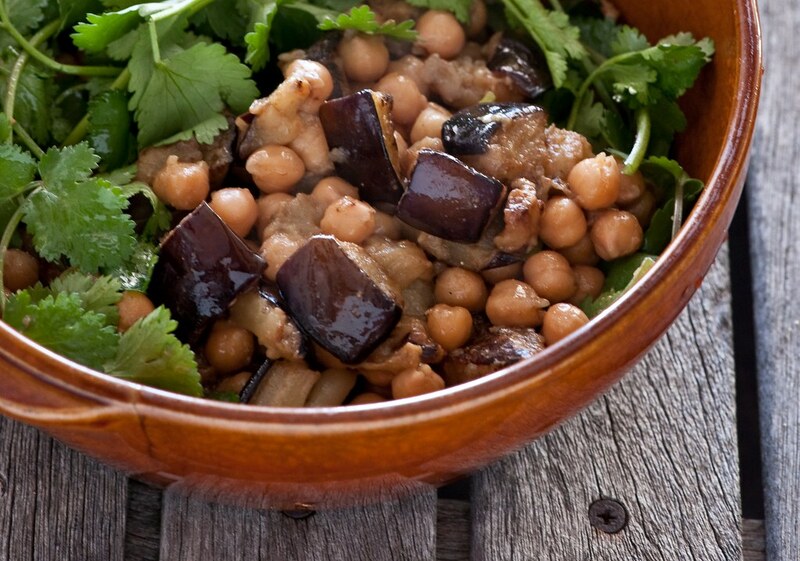 I’m surprised that the eggplant went slimy… did you reheat it in the microwave or in a pan? A skillet on stovetop. I thought with some mid-high heat I might toast any slimy out and maybe get a nice day-after-reheated crust on the bits, but alas, no.